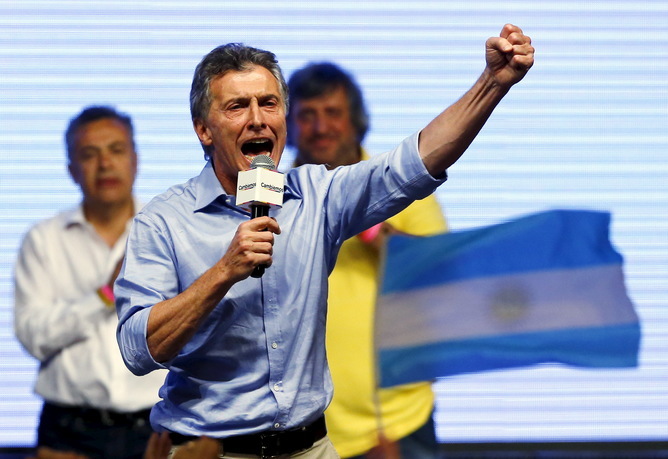 OPINION | What Does Macri’s Election in Argentina Mean for the Region? Home / Argentina / Latin America / Opinion / Venezuela / OPINION | What Does Macri’s Election in Argentina Mean for the Region? The Victory of Mauricio Macri in Argentina’s November 22 run-off election is good news for Argentina and for Latin America, and presents an important opportunity for the United States. 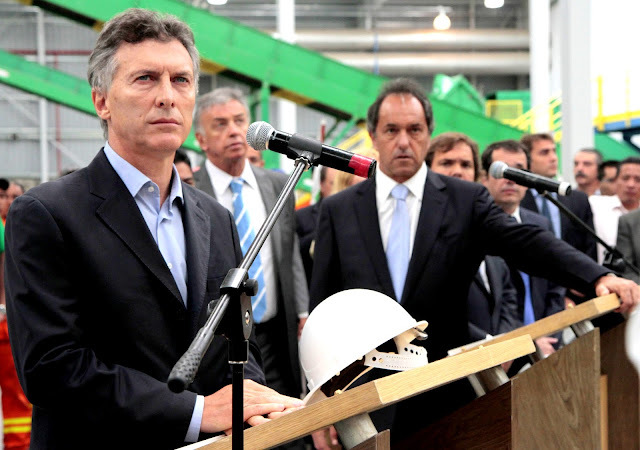 Scioli is the FPV candidate in the 2015 Argentine presidential election, and was endorsed by incumbent President Cristina Fernández de Kirchner. The initial polls pointed him as a favourite, with chances to become president in the first run and avoid the ballotage, but he got to a narrow-margin victory with Mayor Mauricio Macri. The runoff was held on November 22. Scioli lost the elections, and accepted his defeat when 70% of the votes were counted. When Macri assumes office on December 10, it will be the first time in 99 years that Argentina has not had a Peronist, Radical, or military government, and the first time in the nation’s history that an engineer has been the head of state. The presidency of Mauricio Macri also promises to take the nation on a course that is significantly different than that which it has pursued for more than twelve years under the late Nestor Kirchner and his wife Cristina Fernandez. The President-elect has already pledged to pursue a far more pro-market economic policy than did the Kirchners, and a foreign policy that moves the nation away from the Bolivarian Alliance for the Americas (ALBA), while seeking to rebuild Argentina’s ties with nations such as Colombia, Chile and Brazil, and possibly with the United States. As columnist Andres Oppenheimer has noted, Macri’s presidency may represent a turning point in the strategic dynamics of Latin America and the Caribbean. The highest profile “Bolivarian socialist” regime in Latin America, Venezuela, is in the middle of a prolonged political and economic collapse, with the poor performance of its economy, widespread corruption and criminality, and the bizarre behavior of its leadership tarnishing the attempts of all radical left governments to address the region’s very real issues of poverty, inequality, and dysfunctional institutions. Meanwhile, Cuba has temporarily lowered its profile as the traditional intellectual leader of the Latin American left while it seeks to escape from the U.S. sanctions regime that has crippled its economy for 55 years, and Brazil, the region’s most prominent experiment in blending socialism with a market economy is expected to see its economy contract 3 percent this year, even while its government continues to be paralyzed by the vast, unfolding Petrobras corruption scandal. Macri has already promised to seek Venezuela’s expulsion from the trading block Mercorsur for violating the organization’s democratic charter. In many ways, the 2015 Argentine and Venezuelan elections, held within just two-months, have influenced each other. The political charade of Venezuelan populism has arguably shamed Argentines into demonstrating that they can escape on their own volition from a similarly destructive downward cycle. On the other hand, the loss of Cristina’s Victory Front (FPV) in Argentina, like the 1990 loss of the Sandinistas in Nicaragua, reminds the Maduro regime in Venezuela that it risks being stripped of its power if it does not sufficiently control, or avoid, the elections. For senior Venezuelan government and military leaders, the implication of such a defeat goes beyond a loss of power and prestige, since it could lead to their imprisonment on criminal charges, or extradition to the United States. Yet if the Macri victory in Argentina motivates Venezuela’s leadership to redouble its efforts to win at any cost, it also exerts a restraining influence. Since the Macri government will be inaugurated just four days after elections in Venezuela, the Maduro government will not be able to count on an ideologically sympathetic Argentina to validate the outcome in Venezuela if there are widespread signs of irregularities. Beyond Venezuela, the new Macri government is also likely to be particularly well received in both Guyana and Colombia, each of which have faced recent threats of military action by Venezuela, with varying degrees of credibility. Moreover, Macri’s reported interest in strengthening Argentina’s relationship with the Colombian government may also facilitate a more rapid culmination of Colombia’s current peace negotiations with the Fuerzas Armadas Revolucionarios de Colombia(FARC), by strengthening the hand of the Colombian government, while weakening Venezuela, a key ally. With respect to multilateral affairs, the incoming Macri government is reportedly interested in strengthening the nation’s relationship with the Pacific Alliance, comprising Chile, Peru, Colombia, and Mexico, although not ready to formally join the pact. An Argentina-Pacific Alliance bond would arguably push neighboring Brazil in a similar direction. The two initiatives, in combination with the finalization of the Trans Pacific Partnership, would re-energize progress in the Pacific Alliance, and by extension, a market-based model of economic engagement in the Americas. The victory of Macri in Argentina will also have impacts beyond the region. On one hand, Macri’s assumption of power will probably put Argentina’s rapproachment with Iran on hold, although the lifting of sanctions on the later by the international community through its nuclear deal with the U.S. could deepen its importance as a customer for Argentine agricultural goods. With respect to China, driven by the growing political and economic isolation of the outgoing Cristina government, Argentina has increasingly turned to the PRC as a key benefactor. Major deals include two multi-billion hydroelectric plants on the Santa Cruz river valued at $4.7 billion, a $10 billion renovation of the nation’s largest rail system, the Belgrano-Cargas line, and most recently, a $6 billion deal to construct a new nuclear reactor at the Atucha complex. While a number of the deals with China ironically involve the incoming president’s own father, Francisco Macri, his son has promised a review of the legality of at least the recently signed nuclear reactor deal. The government will probably honor its legally-binding contracts with China, but Argentina’s likely eventual return to international business and credit markets will expand the nation’s alternatives for much-needed capital, reducing the PRC to merely one business associate and creditor among many. As with the PRC, the privileged position of Russia for Argentina may similarly be diluted. While Russia will likely continue to be an important purchaser of Argentine beef and a player in the electricity sector, including construction of the $2 billion Chihuido-1 hydroelectric facility and possibly future nuclear plants, a Macri government is likely to move Argentina away from both Russia and China with respect to defense collaboration, and back toward Brazil, at least with respect to weapon system procurements. All these changes will be positive for Argentina, the region, and for the United States. But without adept maneuvering by the Macri government, and an exceptional commitment of resources and attention by the United States, there are no guarantees. Following the fall of the Berlin Wall in 1989, many of the countries of Latin America and the Caribbean briefly embraced U.S.-style democracy and free markets as the path to development, electing pro-US, pro-market leaders to power across the region including Fujimori in Peru, Cardozo in Brazil, and Menem in Argentina, privatizing state-owned companies and pursuing market-friendly policies under the rubric of the Washington Consensus. For the same reason today as then, the United States has a strong interest in investing attention and resources to help Mr. Macri and his incoming government to succeed in bringing development and prosperity to Argentina through free market and free trade policies. The task, though, will not be easy. While the forces of the left are likely to defer to Macri during a brief honeymoon period, his narrow 51.4 percent to 48.6 percent victory is not a mandate that will keep the opposition at bay for long. Moreover, although Macri will have control over the province of Buenos Aires and the government of the autonomous city of Buenos Aires, as well as the national executive, his Cambiemos coalition will have only a minority presence in the Senate, and close to a parity with the opposition in the lower Chamber of Deputies. Nor will Mr. Macri’s coalition hold a majority of the nation’s 24 governorships. Thus, for Cristina Fernandez de Kirchner and the Peronists, who hope to return to power in four years, paralyzing the government in the Argentine legislature, and through street protests, will be a tempting, and relatively easy strategy, albeit one with disastrous consequences for the Argentine people. Although the United States is far from Argentina, there are pragmatic ways in which the U.S. can help President-elect Macri to succeed. A U.S. appeals court has already eased the burden for Argentina in its negotiations with creditors seeking full payment for the debt that Argentina defaulted on between 2001-2002. It is already rumored that Macri will travel to New York prior to assuming the presidency to meet with representatives of the creditor organizations to negotiate a deal that would pave the way for the government to return to international bond markets. With a show of good faith on the Argentine side, the U.S. government could facilitate, and perhaps even underwrite such a deal. Succeeding in this venture will become particularly important for the country as it seeks to manage the debt accumulated by the Cristina administration in the run-up to the elections, including an estimated $19 billion owed to China. The U.S. government can also encourage Western companies to return to Argentina, including tax incentives and programs to expand technology partnerships in areas such as space, telecommunications, agricultural technology, and petroleum, particularly given Argentina’s substantial shale oil potential in fields such as Vaca Muerte. The United States may also have much to offer Argentina with respect to collaboration in the fight against narcotics trafficking, human trafficking, and other forms of organized crime. Narcotics trafficking in Argentina, for example, has expanded dramatically in recent years with new drug routes from source countries like Peru, Colombia and Bolivia, through the Atlantic coasts of Brazil, Uruguay and Argentina, on to Africa and Europe. The U.S. may also wish to actively seek opportunities to renew professional military education and training exchanges, largely cut off under the previous government. One place to start could be inviting Argentina to again send officers to the U.S. Army War College, where international students study the same curriculum, alongside of their U.S. counterparts. The U.S. and Argentina may also be able to expand collaboration against international terrorism. While not all terrorist groups are Islamic, Argentina has the largest muslim community in the region after Brazil, and many of the Islamic terrorist cells uncovered in the region have had ties to Argentina, including Mosheen Rabani, the Iranian diplomat accredited in Buenos Aires, who reportedly worked from his base in the country to recruit terrorists in other Latin American countries, such as Abdul Kadir, who reportedly developed a plan in 2007 to blow up New York’s John F. Kennedy airport. For its part, the Argentine government has long sought justice and clarification regarding the 1992 and 1994 attacks against Jewish targets in the greater Buenos Aires area, and probably would welcome U.S. technical assistance and resources as it continues its efforts to get to the bottom of the case. Indeed, as recently as October 2015, Argentina experienced an elevated alert when one of its consulates received a report of a possible attack by terrorists of Malian ethnicity against a major shopping mall. In the context of such collaboration, the U.S. may also consider temporary programs that reduce tariffs paid for selected Argentine products to enter U.S. markets, similar to benefits conferred to Bolivia, Colombia, Ecuador and Peru under the Andean Trade Pact. With respect to China, the United States must be respectful of the right of both nations to conduct business with each other to achieve mutual benefit, yet also recall that economic engagement with the PRC generates concerns for a range of actors within Argentina, from manufacturers to environmentalists. Within the framework of recognizing the legitimacy of China-Argentina trade and economic engagement, the U.S. can help Argentina to strengthen its institutions and legal frameworks, so that the latter can conduct business with the PRC efficiently, yet in a way that does not unfairly prejudice Argentine merchants or threaten the environment. The United States can also help Argentina strengthen its institutions beyond the domain of commerce. Frustration with corruption runs deep in Argentina. The U.S. can help Argentina build an effective government and the rule-of-law that ensure that the spoils of economic opportunity are not captured solely by a well-positioned few. Indeed, building such an effective government is instrumental for the acceptance and health of free market capitalism, and distinguishes the U.S. from other suitors which do not care about the internal affairs of their associates, so long as they profit from them. Even with a carefully crafted policy backed by ample resources, the path ahead for the United States to rebuild confidence with Argentina, and help the new Macri government success will not come easily. Beyond President-elect Macri’s domestic political problems, Argentina also has one of the highest rates of anti-American sentiment recorded in the continent. Such distrust will require years to overcome in a bureaucracy and a popular culture that was molded for twelve years by the anti-U.S. orientation of the Kirchners. In addition, whatever the willingness of President-elect Macri to improve relations with the United States, the PRC will continue to actively work to maintain its own strong relationship with the country. Indeed, the PRC will continue to have an enormous capacity to benefit Argentina through the purchase of its agricultural products, the performance of loan-based construction projects in strategic sectors such as hydroelectric and nuclear energy, and to work with both the Argentine government and private sector in areas such as space and military collaboration, telecommunications and banking. Indeed, with the collapse of Venezuela, and the ongoing political crisis and economic contraction in Brazil, the strategic importance of Argentina for the PRC will only grow. For those who follow Argentina, one of the few constant features of the nation’s political dynamic is its ability to alternate between impressive achievements and (often partially self-inflicted) crises. Yet whatever the long-term cycles of the country, if the United States can help President Macri demonstrate that free markets, democracy and responsible government produce equitable development and prosperity, the results will be transformative for the region. R. Evan Ellis is professor of Latin American studies at the U.S. Army War College strategic studies institute. The views expressed in this article are strictly his own. The author extends his sincere thanks to those Argentine and U.S. scholars who provided important inputs for this article, including Ambassador Lino Gutierrez, Jorge Malena, Andrei Serbin Pont, Julio Cirino, and various others who preferred to remain unnamed. This article first published at Latin America Goes Global on November 24, 2015. It has been republished with author's permission. All rights are held by the Original Publisher.